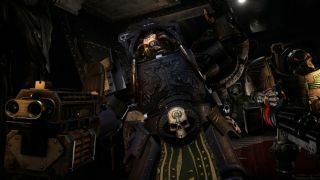 The Space Hulk: Deathwing Summer Trailer is packed with in-game footage, but it's really not very clear about what "in-game footage" actually is. It looks great, but I doubt we're going to see engraved bolter shells ejecting in slow-motion and bouncing off the blood-slick floor in the heat of battle. It's right there in the opening sequence of the new Deathwing Summer Trailer , below the Unreal Engine logo: "In-game footage." My assumption is that because the trailer was created in the Unreal Engine 4, and the game is being made with the Unreal Engine 4, somebody somewhere decided that it qualifies. It's a silly stretch of the term, but healthy skepticism of the marketing angle notwithstanding, it's a pretty cool trailer, too. I'm not a "Warhammer guy" by any measure, but space marines, armed and armored beyond all sane limits, holding the line against hordes of onrushing alien monsters? That's my kind of game. Sadly, the text accompanying the trailer doesn't tell us anything we didn't already know: It's an FPS based on the Warhammer 40,000: Space Hulk game being developed by Streum On Studio, the guys who did E.Y.E. : Divine Cybermancy. There's still no release date info, but the tail end of the trailer does confirm that a PC version is in the pipe.